Almost lost in all the dollar estimates of property damage is the human loss, suffering, and stress. I am not an expert in repairing flood damage, or in dealing with insurance companies, FEMA or all the other pieces that will go into homeowners getting the funding needed to repair or rebuild their homes. But I do know a bit about construction after 44 years in the field, and I have been soberly reflecting on the many hurdles that face everyone involved in restoring/repairing tens of thousands of homes, more or less all at the same time. 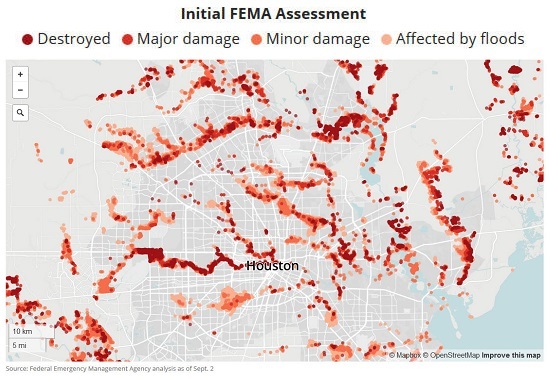 Preliminary estimates set the number of flood-damaged homes in Houston at around 100,000. More recent estimates put the number at around 40,000. No one yet knows how many homes in Florida have been damaged by Hurricane Irma, but the number will undoubtedly be a big one. 1. The average cost of homes in Houston is reportedly around $300,000. Many coastal areas in Florida are similarly valued. Just as a guess, many of the affected homeowners probably have mortgages in the $200,000 range. It's been reported that only 1 in 6 in the affected areas of Houston have flood insurance, suggesting 85% of those whose homes were rendered unlivable will need to borrow money to fund the repairs. It seems federal agencies offer homeowners loans for this purpose, or access to what is effectively a second mortgage. If the repaired home will be worth $300,000—questionable, perhaps, for those houses which have been repeatedly flooded by lesser storms—then how much money will homeowners be willing to borrow to keep the home? If a homeowner has $50,000 equity and a $200,000 mortgage, and he has to borrow $100,000 to make the home livable and replace all the ruined contents, does it make financial sense to have $300,000 in mortgages on a house that's worth $250,000? How much is the emotional connection to the home and neighborhood worth? How many homeowners simply can't afford to borrow the sums needed? If the homeowners affected by Hurricane Katrina are any guide, between a quarter and a third of those without flood insurance might "jingle mail" their mortgage/title to their lender, i.e. abandon the property via default, leaving the lender to deal with the repair or demolition costs. Lenders are notoriously reluctant to dump tens of thousands of dollars into abandoned homes without a clear projection of the financial payoff to investing substantial sums in defaulted properties. 2. What happens to property values in neighborhoods in which numerous homes are unrepaired or abandoned? If history is any guide, property values decline sharply until the point that the neighborhood has been restored to its pre-damaged state. That is typically several years at best and a decade or longer in sub-optimal conditions. 3. Every construction project will need plans and specifications, a building permit and inspections of the construction progress for both the city/county and the lender. Do the affected cities have enough building department staff and inspectors to handle this massive wave of permit applications and inspections of tens of thousands of scattered job sites? 4. It's much easier to build a subdivision of 100 nearly identical homes on a single parcel than it is to repair/rebuild 100 homes distributed over a wide area, each with a mix of unique problems to deal with. In other words, it's very difficult to achieve any economies of scale in repairs/rebuilds of thousands of homes of various ages and designs beset by varying degrees of damage. 5. The building materials industries of North America are large enough to ramp up production to supply whatever materials are needed, but the skilled labor required is another story. Demolishing waterlogged drywall and paneling, removing ruined flooring, carpets, and furniture, etc. are fairly low-skill tasks that can be completed by relatively inexperienced workers. But tasks such as removing and replacing electrical wiring and outlets, installing new panel boxes, reframing damaged roofs, etc. do not lend themselves to lightly trained, inexperienced workers. It seems likely that the local experienced work force will quickly be committed (at much higher rates of compensation, of course), leaving many homeowners scrambling to find contractors who can restore their house to livability. 6. It can be very difficult to tell the difference between a fly-by-night "contractor" who smells opportunities for fraud and a legitimate builder who moves in seeking legitimate work. All sorts of verifications of legitimacy can be faked: contractors' licenses, referrals, etc. 7. Even experienced contractors can get over their heads if they take on more work than they can manage. In times of high demand, contractors can accept jobs that they would be able to complete in normal times. But all sorts of contingencies can arise that make it difficult for contractors to perform all the work they committed to: subcontractors can suddenly announce they're no longer available, workers can quit to go out on their own, financing and permits can languish and then all get approved at once, materials can suddenly become scarce—the list is long. 8. Each of these challenges could become a logjam that delays the rebuilding:some homeowners will contest insurance claims, others will find the permit process has slowed to a crawl, others will struggle to get the second mortgage process completed, and still others will have the money lined up but be unable to find an experienced contractor to do the work. 9. How committed are homeowners to their neighborhood if it is in a flood plain? how old is the neighborhood? How many residents have lived there for decades? These are seemingly ephemeral issues in the dollars-and-cents calculations of total losses and insurance claims, but they matter to those making the decision to stay and rebuild or pull up stakes and move to less vulnerable locales. 10. Disposing of the enormous quantities of construction debris generated by widespread flooding and other damage is another process we typically take for granted: debris boxes appear and are hauled off to some faraway place for disposal. But existing facilities might well be overwhelmed by the sheer mass of construction-related debris. 11. How many workplaces, schools and other institutions will be shuttered for repairs? How many people will be displaced as a result? Unemployment insurance is rarely a full replacement for wages/salaries lost to layoffs. Small business owners face the same calculus as homeowners—is it worth repairing the existing place or is it financially wiser to simply close up shop and move on? 12. The higher costs imposed by rebuilding and insurance claims will extend far into the future. Homeowners who have to borrow money to repair/rebuild will have less disposable income going forward, as the second mortgage will siphon cash from their earnings. Insurers and re-insurers will raise rates to recoup their losses and recalculate the potential for future losses from super-storms that seem to be becoming more common—i.e. "100-year floods" that now seem to occur every 10-15 years. These higher rates will siphon additional funds from homeowners and businesses, leaving less disposable income for other consumption/ investment. 13. In the judgment of many observers, housing in much of the nation is overvalued, i.e. in a bubble driven by cheap, abundant credit. The timing of sinking serious sums into housing for repairs might be unfortunate if housing rolls over and loses 20%+ of its bubble-top valuations. Valuations may be recalibrated on a secular economic-cycle basis and by a reassessment of demand for homes facing near-certain risks of future flooding/storm damage. Though the media will quickly move on to new crises, scandals and disasters, the process of repairing all these tens of thousands of homes will not be quick. The second-order consequences will stretch on for years: insurance losses, mortgage defaults, and foreclosures, neighborhoods scarred by abandoned houses, cities and various government agencies dealing with thorny decisions about buying the most flood-prone homes, expanding drainage systems and so on. Almost lost in all the dollar estimates of property damage is the human loss, suffering, and stress. I'm not sure I could muster the emotional and financial stamina required to get through a long and often frustrating rebuilding process. FEMA map courtesy of correspondent David E.